There is a great debate about which type of analysis is better for a trader. Is it better to be a fundamental trader or a technical trader? In this article we will explore what the difference is between these two types of traders and which pieces of information forex traders in particular tend to look at. Fundamental analysis involves assessing the economic well-being of a country, and by extension, the currency. It does not take into account currency price movements. Rather, fundamental forex traders will use data points to determine the strength of a particular currency. A fundamental forex trader will analyze the country’s inflation, trade balance, gross domestic product, growth in jobs and even their central bank's benchmark interest rate. Below is an example of an economic calendar where fundamental traders will be able to keep up to date with the latest data releases. There are many data releases on any given day which is why traders should know how to filter the calendar to show relevant information only. By assessing the relative trend of this and other data points, a trader is analyzing the relative health of the country’s economy and whether to trade the future movement of that country’s currency. The table below summarizes the general effects that different economic data tends to have on the strength of a currency. However, this is not guaranteed as there are many factors that influence currency movements. *Developed nations welcome moderate inflation as it is a sign of a growing economy. Developing nations view decreasing, or maintained, inflation as a positive statistic as this keeps price levels in check. Technical analysis involves pattern recognition on a price chart. 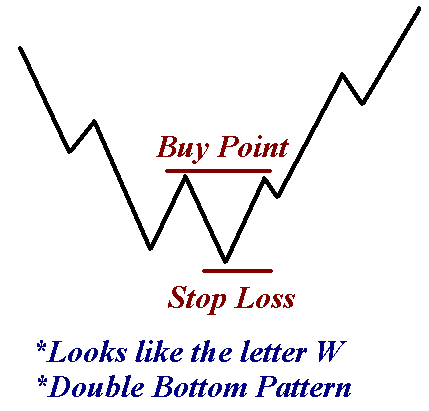 Technical traders look for price patterns such as triangles, flags, and double bottoms. Based on the pattern, a trader will determine the entry and exit points. Unlike fundamental traders, a technical trader is not as concerned about why something is moving because the trends and patterns on the charts are their signals. 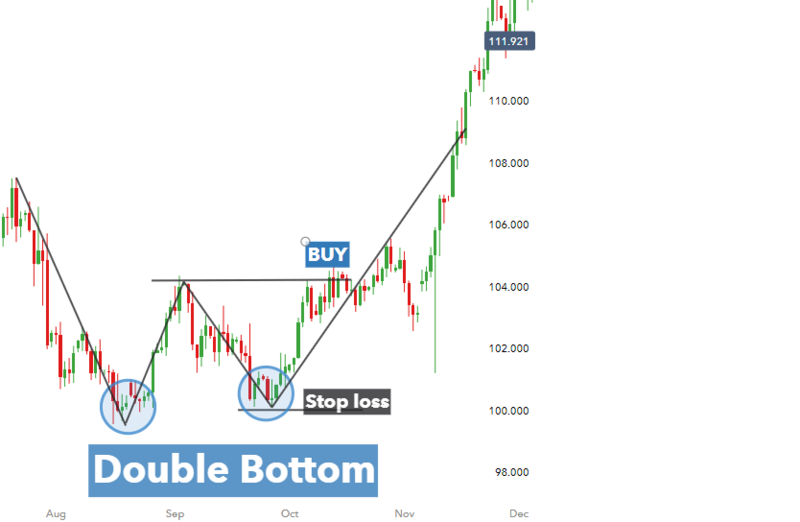 Below is an example of a chart pattern - the double bottom pattern. The market makes the first low, rebounds slightly before creating a new low and subsequently gains upward momentum as the trend reverses. Technical traders will look to set a stop loss at the recent (lowest) low and wait for the market to produce higher highs and higher lows before placing the long trade. In practice, technical traders will need to identify the pattern as shown below on the USD/JPY daily chart where the “W” shape can be seen. A technical forex trader will assess the price action, trend, support and resistance levels observed on a chart. Many of the patterns used in technical analysis of forex markets can be applied to other markets as well. Additionally, traders make use of indicators and oscillators which are added to a price chart when analyzing foreign exchange markets. Moving averages, Bollinger Bands, MACD, Relative Strength Index (RSI), and stochastic tend to be some of the more common tools in a technical traders tool box. Indicators are preferred by technical traders because they are easy to use and provide clear signals. Technical analysis does not include ‘black magic’ that many fundamentalists claim. Getting started in technical analysis can be done quickly by assessing the direction and strength of trends. Traders will use the trend analysis to help them determine which pair to trade and the direction to trade it. Below, is an example of how a technical trader would notice this 6,000 pip trend where the AUD is very strong relative to a very weak EUR (which is why the currency pair is moving down). Furthermore, it is clear to see that the currency pair is trading in a strong downward direction. This is referred to as a tend and traders make use of key levels, levels of support and resistance, and indicators to identify trends as soon as possible and with accuracy. 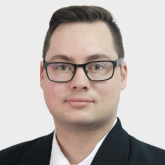 Finding out how to identify strong and weak currencies will provide traders with an indication of which currency pairs are most likely to trend and therefore lead to higher probability trades. A trader would trade in the direction of this particular trend by selling the EUR/AUD pair. Fundamental and technical analysis involve very different strategies and approaches to trading; offering unique value and insights to support trading decisions, and when to enter or exit a trade. While some traders prefer to use these types of analysis separately based on their preferred trading style and goals, many use a combination of the two. The benefits of combining fundamental and technical analysis are wide ranging. Fundamental traders monitor economic data releases, and many do so with the intention of trading the news. It is essential that traders adopt sound risk management when doing so as volatility can spike immediately after important releases. Technical traders have different styles and strategies. Explore these thoroughly to find out if this type of analysis suits your personality. And if you are just starting out on your forex trading journey, you can learn the basics with our free New to Forex guide.